What Is A Crossover Toe? Crossover toe is a painful condition in which the second toe drifts out of place, eventually crossing over and lying on top of the big toe. In some cases, the second toe lies under the big toe. Crossover toe can occur at any age, but is most commonly found in middle age and older adults. Crossover toes are frequently associated with bunions. This man has both. Don’t confuse crossover toe with hammertoe. While both conditions involve a toe (any toe can be affected) that doesn’t lie in its normal position, they are quite different, and crossover toe is a much more complex condition. When a toe is described as being a crossover toe, it has become buckled, contracted, or crooked, and has literally crossed over or under the big toe (or adjacent toe). Crossover toe is a progressive condition, usually occurring over a period of time. But it may also appear after an injury, from overuse, or after a steroid injection to an area near the second toe. It’s generally believed that crossover toe is caused by abnormal foot structure and faulty biomechanics, as are bunions. The combination of these conditions leads to repetitive stress on the joint of the second toe, weakening the structures which stabilize it. The result is a toe that drifts out of place and becomes a crossover toe. Other foot conditions accompany and may contribute to crossover toe, such as bunions, hammertoe, neuroma, arthritis in the big toe joint (hallux rigidus deformity), an elongated second metatarsal (2nd toe is longer than the big toe), a tight calf muscle, or an unstable arch. In a normal foot, the plantar plate and associated ligaments stabilize the 2nd metatarsal joint. When chronic inflammation or damage occurs in this area, the stabilizing structures of the joint slowly change. One by one, the supporting ligaments fail, leading to chronic hyperextension on the toe joint, which then stretches or re-attenuates the plantar plate. This change in the toe’s supporting structures causes an imbalance, leading to instability in the toe, which eventually dislocates in the direction of the big toe. Crossover toe can be difficult to diagnose in its early stages, when it’s most easily treated. A patient may have pain in the ball of the foot, but the toe exhibits no signs of dislocation. Unfortunately, without treatment, the toe will worsen and eventually dislocate. But if the crossover toe is detected by a podiatrist at an early stage, non-invasive treatments like bracing, strapping, taping, and orthotics can be employed to keep the toe from becoming a crossover toe. Once the second toe begins to drift towards the big toe, it will not return to its original position. Taping positions the affected toe in it’s original alignment, which provides stability and relieves pain and swelling. As the inflammation of the joint decreases, healing can occur over a period of months. Metatarsal pads and orthotics can alleviate pressure on the plantar plate and/or metatarsal and redistribute body weight across the surface of the foot. Healing can slowly occur as inflammation subsides. Over the counter anti inflammatory medicine like aleve and advil can decrease inflammation and pain in the symptomatic joint. If these conservative treatments fail, or if the displacement of the toe is far advanced, surgery to re-align the toe followed by physical therapy may be recommended by your podiatrist. Frieberg’s Infraction (aka Frieberg’s Disease) is a disorder of the metatarsal bones in the foot (the long bones between your ankle and your toes). Pain is felt in the ball of the foot due to damage to the front of the metatarsal bone. Frieberg’s Infraction can occur in any metatarsal but most frequently, the second or third metatarsals. **Note – the word “infraction” in this case, is a combination of Infarction (obstruction of the blood supply, leading to the death of tissue) and fracture (as the infarction is usually caused by microfractures). Typically, Freiberg’s Infraction is seen in adolescents 13-18 years of age who are very active. Females are 5 times more likely than males to have this condition. The patient usually has a longer second metatarsal or toe than the others and may have had previous stress fractures of this bone. When this deformity is present, the longer metatarsal takes more of the weight when walking, running, and jumping. This repeated stress on the bone and joint can result in microfractures or joint damage, interrupting blood supply to the bone and cartilage. If undiagnosed, and the lack of blood flow continues, bone cells may die (avascular necrosis). This is called Freiberg’s Infraction. When bone tissue dies, it undergoes changes such as flattening of the joint surface, and moving the joint may cause pain and swelling. As the damage increases, the joint between the affected metatarsal and the toe degenerates. The damaged bone may fracture, leading to small, loose bone fragments in the joint area causing further pain. Usually occurs only in those whose second toe (2nd metatarsal) is longer than their big toe (1st metatarsal). A dull pain in the ball of the foot behind the second toe. Pain gets worse when walking, especially in high heels. Some patients have no symptoms (asymptomatic) and the Freiberg’s Infraction resolves without treatment. But it’s advisable to seek treatment from a podiatrist as soon as symptoms appear, because if left untreated, tremendous damage can occur to the metatarsal, requiring surgery. If you have pain in the ball of your foot, please make an appointment with the podiatrists at PA Foot and Ankle Associates to determine if your pain is caused by Freiberg’s Infraction or another condition. Plantar Fasciitis is the leading cause of heel pain. In medicine, the suffix itis refers to irritation or inflammation of an organ, and in this case, to the plantar fascia, a band of tissue which connects your heel bone (calcaneus) to the ball of your foot. Pain can be felt anywhere along this path. The classic sign of plantar fasciitis comes in the morning, when you step out of bed – a sharp pain in your heel. Gradually, as the tissue warms up and becomes flexible, the pain fades – maybe not completely, but substantially. It may then return if you stand on your feet all day or exercise, especially if you run or exercise strenuously. 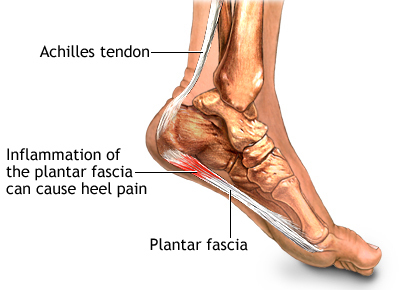 What causes the heel pain of plantar fasciitis? When the plantar fascia is constantly stressed, small tears occur in the tissue. The tears make the plantar fascia weaker, less able to do its job of support and shock absorption. This offloading of the work causes stress on the surrounding tissues, which is the actual cause of the pain. Plantar fasciitis also makes itself known to those who are carrying more body weight than normal, like pregnant women or obese individuals. You might also develop plantar fasciitis if you made a poor choice in shoes and wear a style which doesn’t support your feet correctly. People with flat feet also frequently suffer from plantar fasciitis, as do long distance runners . The Plantar Fascia acts like a shock absorber for your foot, and also supports your arch. If the plantar fascia receives repetitive stress, such as from exercising on hard surfaces, unsupportive footwear, or too much pressure from weight, small tears form in the tissue. These tears cause irritation in the surrounding tissue, which triggers pain. If plantar fasciitis is left untreated, the condition may get substantially worse. Knee pain is also frequently reported in patients with plantar fasciitis, due to their change in gait to compensate for the heel pain. If these methods aren’t successful in relieving your pain, your podiatrist may recommend steroid injections, PRP injections, EPAT (shockwave) therapy, Radiofrequency Ablation (RFA), or in extreme cases, surgery. Help! The Arches In My Feet Are Falling! In a normal foot, only the smallest toe is visible when viewed from behind. A common problem among the elderly and increasingly middle aged patients is collapsing arches, medically known as Adult Acquired Flat Foot Syndrome (AAF), or Posterior Tibial Tendon Dysfunction (PTTD). This is a progressive condition in which the arch of the foot collapses and the bones of the ankle and foot fall out of proper alignment. A magnitude of foot problems develop as we age and many of these complaints begin about the age of 60. Among the most serious from a biomechanical standpoint is Adult Acquired Flat Foot Syndrome (AAF). Treated early enough, symptoms can be arrested or at least slowed. Untreated however, AAF becomes an extremely painful condition which ultimately affects the entire body and the patient’s lifestyle, as gait is significantly altered by the out-of-line foot and ankle. This malalignment can create pain, fatigue, and discomfort throughout the entire body. As we age, many of our muscles, tendons, and ligaments lose their ability to stretch and support our bones. If you’ve ever discovered an old rubber band in the bottom of a drawer, you’ll get the idea – it’s more likely to snap than stretch. The Posterior Tibial Tendon, which attaches the calf muscle to the bones in the foot, is largely responsible for the support of your foot when walking, and to hold up the arch. With aging, overuse, or trauma, this tendon degenerates and loses its function, along with associated ligaments and joints on the inner side of the ankle and foot. Ligaments are responsible for holding bones in place, and when they fail, bones shift and deformity is the result. The deformity causes malalignment, which leads to more stress and failure of the ligaments, and a slow collapse of the arch which becomes debilitating in its later stages. AAF is most frequently seen in women, especially those who start out with somewhat flat feet or a pronated (rolls inward) foot. These attributes place extra stress on the soft tissue structures, along with the posterior tibial tendon and the ligaments on the inner side of the foot. Other contributing factors are diabetes, obesity, rheumatoid arthritis, and hypertension. People who play high impact sports may also develop tears in the posterior tibial tendon, eventually leading to AAF. The symptoms of posterior tibial tendon deformity change considerably as the condition progresses. Initially, pain may be felt along the tendon’s path on the inside of the foot and ankle. This area may also be red, warm, and swollen. As the arch starts to flatten, in addition to pain, the foot and toes turn outward and the ankle rolls inward. As the arch flattens even more, the pain shifts to the outside of the foot, just below the ankle. Arthritis develops in the foot, and later may develop in the ankle, sometimes causing the ankle joint to lock. Treatment of adult acquired flatfoot depends on the stage of the condition and its severity. Mild cases may only warrant rest, ice, and custom orthotics. Advanced cases may require immobilization, bracing, or even surgery. Early intervention by a podiatric surgeon is key to slowing the progression of PTTD. At the onset of PTTD, a boot or brace is used to support the arch and relieve strain on the soft tissues, including the tendon. When pain has subsided, custom orthotics are used to reduce the stress on these tissues. However, as the arch has already fallen, the deformity may progress. If pain persists after these conservative measures, surgery to correct the deformity may be recommended.